Amsterdam during the holidays. Photo Dena Timm. 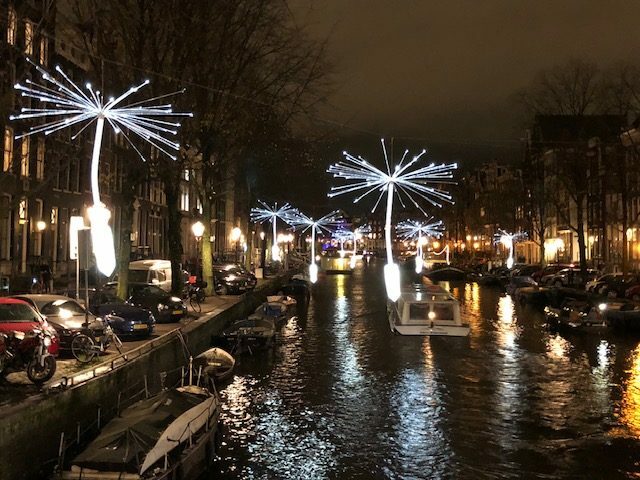 An Amsterdam canal boat, the ideal way to see the city’s holiday lights. Photo Dena Timm. 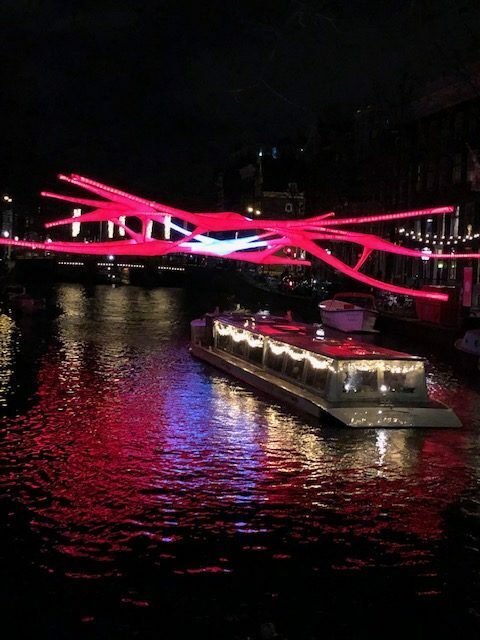 …The Amsterdam Light Festival, 30 lit sculptures by artists along the canals and through the streets. Perhaps best seen by canal boat, a 75-minute ride through the city, from 5-11 p.m. Book online at BoatAmsterdam.com. For all routes and more information. Until February 20. 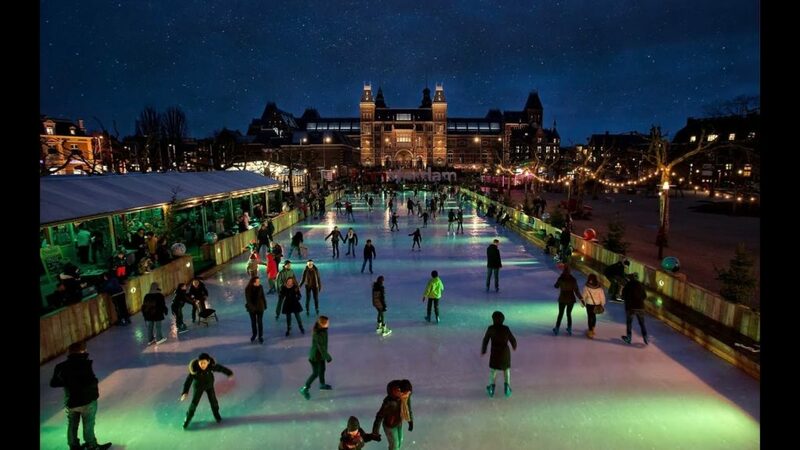 …The Amsterdam Ice Village: skating rink, market stalls, food and drinks. Don’t miss the oliebollen, deep-fried dough balls dusted with powdered sugar, studded with raisins and currants. All in front of the magnificent Rijkmuseum, Museumstraat 1. Until February 4. …A classical Amsterdam holiday: Christmas carols sung by the Choir of St. John’s College, Cambridge (December 16, 11 a.m.); or Handel’s ‘Messiah’ (December 23, 2:15 pm). Both at the Concertgebouw adjacent to the Museumplein. For more music, concertgbouw.nl. Starry, Starry Night. Photo Dena Timm. …Three of Amsterdam spots with fireplaces and perhaps a warming cognac: The Lobby, Hotel V, Nes 49; the Shiraz Wine Bar, Lijnbaansgracht 267; the Lion Noir Restaurant, Reguliersdwarsstraat 28. …For a great view of the city: The A’Dam Lookout, indoor-outdoor decks 330 feet skyward atop the Sir Adam Hotel overlooking the IJ (‘Eye’) river, which you cross on a three-minute free ferry ride. And alongside the decks, the Over the Edge Swing, Europe’s highest. Decks and swing open, 10:30 a.m.-10 p.m. Overhoeksplein 5. Looking at horizons from The A’Dam Lookout brings to mind 2019 vacations. Specifically, walkabout trips with The Wayfarers, the best walking-trip company we know. In the spring, why not walk six days in Western Sicily, April 28; Italy’s stunning Amalfi Coast-isle of Capri walk, May 12; or Cuba, March 16. 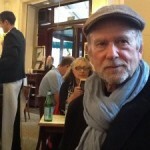 I loved The Wayfarer’s signature adventure, England’s Coast-to-Coast walk, June 15, July 6, September 14, or October 5. Meet people, see the countryside, and stay healthy, courtesy of The Wayfarers, our 2019 New Year’s resolution. Contact The Wayfarers, www.thewayfarers.com; 800-249-4620.